Ida is a 3L student in the Common Law program and pursuing an Option in Law & Technology. She pursued her undergraduate degree in Political Science, Communications, and World Islamic & Middle East Studies at McGill University. Ida has worked with civil society organizations and our Faculty professors to participate in a roundtable regarding women’s e-safety, and spearheaded an annual Self-Defence series. Ida hopes to continue highlighting the intellectual and cultural diversity of our Faculty by institutionalizing our annual Diversity Night. She was awarded the Scarlet Key Award from McGill University to recognize her dedication to extracurricular leadership and served as Special Ambassador to both former UN Secretary General Ban Ki-moon and the current Minister of Justice and Attorney General of Canada. When she isn’t napping, she is watching footy and listening to J Cole. Ashley is a 3L in the English Common Law program. Originally from Cape Breton, Nova Scotia, she has called a half dozen places ‘home’, including Rotterdam, Netherlands and, most recently, Toronto. She studied psychology in her undergrad and developed a strong interest in the psychology and sociology of law — particularly therapeutic jurisprudence. During her undergraduate studies she was a student advocate as a councilor with the Students’ Union. As a law student, she continues to advocate for students with a focus on creating practical resources and events to improve student experiences. She also represents student interests as a section member of the OBA. Ashley’s passion for the law is rivalled only by her passion for food. She cooks competitively, and has competed in the World Food Championships, but most enjoys using her spare time to cook for her friends. Maja is a 3L in the English Common Law Program, with an undergraduate background in Political Science, Criminology, Socio-legal Studies from the University of Toronto. 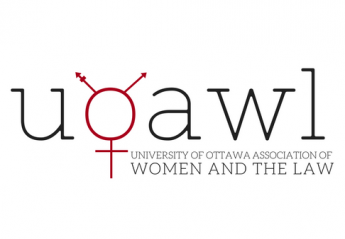 She is super excited to be representing and promoting the needs and interests of women in the legal profession for a second time around through the various initiatives UOAWL has planned for this upcoming year! In addition to supporting the UOAWL exec, you can find her promoting the newly-founded uOttawa First-Generation Network or facilitating legal education workshops and Mock Trials for students at various Ottawa elementary and high schools. Most recently, her work on the Sociology of Social Movements (touching on women employed in third-world sweatshops) was published in the University of Toronto Sociology and Criminology Undergraduate Review, for which she was awarded the Academic Journal Scholarship for the best overall article submission. Jessica is a 3L in the English Common Law Program. Born and raised in Vancouver, Jessica graduated with a BA in Psychology from UBC. Due to her passion for advocacy and public legal education, Jessica has volunteered as a presenter for LEAF, OJEN, and PBSC. As a firm believer in the empowerment of women, Jessica is excited to return to UOAWL and assist with the many events that highlight women’s achievements in the legal profession. In her spare time, Jessica enjoys baking, watching movies, and exploring the city. Kate is a second year student in the English Common Law program. Prior to starting law school, Kate spent several years working for Global Affairs Canada and was posted to Mozambique. She has a degree in International Development and Globalization, and a Master’s degree in Conflict, Security and Development from King’s College in the UK. This year, Kate is also the student member of the OBA Young Lawyers East executive. Outside of law, she is passionate about women in sport and coaches artistic swimming in Ottawa. Emily is a 3L in the Common Law program. She obtained her Bachelor of Commerce Honours from the University of Manitoba, double majoring in International Business in Marketing. Emily is passionate about equality, particularly equal compensation, and access to justice issues. She was selected to participate in the Refugee Sponsorship Support Program this term and is very excited to help refugees with their sponsorship files. Emily loves to travel often to discover new cultures. She has been on three volunteer trips to Ecuador, India, and Kenya, and spent six months in Rouen, France in her undergrad to study business. Melissa is a 3L in the English Common Law program. She completed her Bachelors of Commerce at the University of Toronto. Raised in Toronto, this is her first time away from home. Melissa is heavily interested in promoting gender equality and how the law aims to help female empowerment. She is involved with different social justice groups like LEAF and helped with the Human Rights Clinic last year. In her spare time, Melissa enjoys reading and cooking. Laura Thistle is a 2L in the English Common Law program. Last year, she served as a 1L Representative for UOAWL. Laura spent her summer working at a criminal defense firm where she was mentored by Danielle Robitaille, recipient of the Muriel Duckworth Award for raising consciousness of feminism in the legal community. Laura cares deeply about sexual assault law and feminist legal issues. In her spare time, Laura loves playing piano, exercising, or visiting her family and friends in Toronto. Victoria is a 3L in the English Common Law program, intending to complete an Option in Social Justice. She completed her undergraduate degree at Dalhousie University in Environmental Sustainability and International Development. Victoria is involved with various equity-seeking groups within the Faculty including OutLaw, The Social Justice Caucus and UOWAL. In her (limited) spare time, she enjoys traveling, reading and knitting misshapen hats for her friends. Angela is a 3L in the English Common Law program. Her research is focused on examining family law through a critical ethics of care lens. She currently works as an intern with D’Artois Mediation. She is also the English Executive Editor for the Ottawa Law Review and a Publication Officer with Global Affairs Canada. Angela is an unapologetic feminist, committed to revealing the lived experiences of women who interact with the legal profession. Angela was a stay-at-home mum for six years prior to starting law school, three of which were spent as a “trailing spouse” in Herzliya, Israel. She now lives happily in Ottawa with her husband, A., and two kids, Budsie and Pixie.